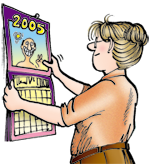 August | 2017 | FBorFW Strip Fix For Better or For Worse Comic Strip by Lynn Johnston. This entry was posted in Uncategorized on August 1, 2017 by stripfix. Lynn's Comments: During our offsprings’ retreat to Camp Tillicum, parents were invited to a family day so we could see what was going on. The dining hall was of great interest to me. I remember thinking how much fun it would be to sit with 50 other kids and eat wieners and beans. This entry was posted in Uncategorized on August 2, 2017 by stripfix. Lynn's Comments: I had a chance to meet the two cooks who provided the meals, and it didn't take long to figure out why, at the end of the day, they were more exhausted than the kids were. This entry was posted in Uncategorized on August 3, 2017 by stripfix. Lynn's Comments: Another true story. This entry was posted in Uncategorized on August 4, 2017 by stripfix. Lynn's Comments: My son, Aaron, told me that porcupines had made a hole in the girls’ shower hut. The rest of this story is all "What if?" This entry was posted in Uncategorized on August 5, 2017 by stripfix. Lynn's Comments: King-sized beds were invented for a reason. Our bedtime habits truly establish our tolerance threshold. If you are OK with your partner’s sack-time etiquette (or lack thereof)…then you might be destined for a long lasting relationship. If not, you are doomed. King-sized beds and separate bathrooms have been touted as saving graces. I wouldn't have dreamed of separate bathrooms until this luxury presented itself in my most recent living space. Yes…give me a home where the buffalo roam, but make the privy a two-holer! The strip you see here was inspired by a friend of mine. He once complained to me about his wife’s ability to swipe all the blankets in her sleep: she would roll toward him, tucking the blanket under her side. Then she would clutch the top of the remaining blanket and roll the other way, pulling everything with her. He called it "The Russell roll." (Russell is her maiden name). I thought it would make a great strip…but this is how the muse made it turn out. This entry was posted in Uncategorized on August 6, 2017 by stripfix. Lynn's Comments: This didn't happen, of course, but as Farley Mowat liked to say, "If it didn't happen, it should have." The buildings at Camp Tillicum were old and in need of repairs, but nothing like this! Kids scoured the walls for knotholes hoping to see into the showers, and when none existed, stories were told anyway. I couldn't help being a bit jealous of my kids’ camping days at Tillicum. This was a place where great memories–true and false, could be made. This entry was posted in Uncategorized on August 7, 2017 by stripfix. Lynn's Comments: Because the Patterson house was a combination of two houses I had lived in, it was a real challenge when it came to renovating. The real house on which this aspect of the cartoon house was based had a bedroom on this side, and there was no room for an addition anyway. My head sometimes spun with the decisions I made, and the storylines I fabricated. This entry was posted in Uncategorized on August 8, 2017 by stripfix. This entry was posted in Uncategorized on August 9, 2017 by stripfix. This entry was posted in Uncategorized on August 10, 2017 by stripfix. This entry was posted in Uncategorized on August 11, 2017 by stripfix. This entry was posted in Uncategorized on August 12, 2017 by stripfix. Lynn's Comments: I have had yard sales. I have helped with yard sales. I now know they are far more trouble than they are worth. Still, the fun factor makes them a good idea anyway. One year, I joined the "5-Mile yard sale"; an event, that happened every three years or so on the 5-mile stretch of Macpherson Drive in Corbeil, Ontario. The word would go out and everyone on this country road would bring their stuff to the end of their driveway. This made for a great 5-mile walk as we perused each other’s cast-off clothing, kitchen gadgets, car parts, and other effluvia. I had my own pile of junk to sell, and found myself rooted to my post. When I told my kids they could keep what they earned by selling their unwanted toys, they volunteered to take over while I bumbled off down the road in search of treasure. I came home with a purse. When my husband saw the purse he laughed. He said all we were doing that day was exchanging junk! This was true. I told him that on my hike down the road, I had seen an old blue tractor for sale. He lit up. A few minutes later, he came back on the tractor as happy as a clam. I asked what he was going to do with a tractor. We had property, but weren't farming or mowing it. He didn't know. The thing is…he had always wanted to own a tractor. The moral of this story is: if your husband buys a tractor (that he doesn't need) at a yard sale, you are free to buy whatever you darn well please from then on. A short while later, I came home with a puppy. Game on! This entry was posted in Uncategorized on August 13, 2017 by stripfix. Lynn's Comments: Every one of us can go back in time to remember a perfect starry night. Maybe it was on a camping trip or maybe on the edge of a city; looking up at the stars never gets boring, never gets old. How do you describe a perfect starry night? The over-used word "awesome" genuinely belongs here. This entry was posted in Uncategorized on August 14, 2017 by stripfix. This entry was posted in Uncategorized on August 15, 2017 by stripfix. Lynn's Comments: This is me at the age of 9 or 10. I was the class clown. I remember a teacher using that old cliché: "We're not laughing at you, we're laughing with you." and I wanted to say, "No! I want you to laugh AT me!" I often thought kids hung with me because I was the one most likely to take a dare, break the rules, and get myself in trouble. I guess I was. It was a way to be where the action was! This entry was posted in Uncategorized on August 16, 2017 by stripfix. Lynn's Comments: I got a lot of mail on this one. There are a lot of lonely people out there. In school, surrounded by people my own age, I considered myself lonely. This entry was posted in Uncategorized on August 17, 2017 by stripfix. Lynn's Comments: The old adage, "misery loves company" described some of my early friendships. I gravitated to the kids who were on the outside looking in. We weren't exactly misfits…we thought we were misunderstood. This entry was posted in Uncategorized on August 18, 2017 by stripfix. 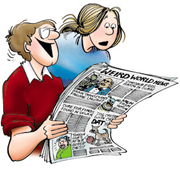 Lynn's Comments: Michael in the strip and my son in real life were named for a school friend - Michael VadeBoncoeur was destined to become a comedy writer. He eventually wrote for the CBC and created blackout comedy skits for places like Yuk Yuk’s in Toronto. This entry was posted in Uncategorized on August 19, 2017 by stripfix. Lynn's Comments: This is Northern Ontario. I need not say more. This entry was posted in Uncategorized on August 20, 2017 by stripfix. This entry was posted in Uncategorized on August 21, 2017 by stripfix. This entry was posted in Uncategorized on August 22, 2017 by stripfix. This entry was posted in Uncategorized on August 23, 2017 by stripfix. Lynn's Comments: These drawings were done before I began to pay real attention to anatomy. Check out the length of the kids’ arms. In real life their bodies would be impossibly long! As someone who once did anatomical drawings for a living, this surprises me! This entry was posted in Uncategorized on August 24, 2017 by stripfix. This entry was posted in Uncategorized on August 25, 2017 by stripfix. Lynn's Comments: I remember my first kiss. It was in Teddy D’s attic. He and Joanne K and Terry M and myself were playing spin the bottle. When the bottle matched me up with Terry, we leaned forward and kissed on the lips. I remember the feeling. It was fast, dry, and his upper lip was really fuzzy. This entry was posted in Uncategorized on August 26, 2017 by stripfix. Lynn's Comments: Occasionally, I would use the strip for a personal rant. I got my point across to my family in a way that was, perhaps, more palatable than the real thing. Not to say that I didn't rant about this for real. I did. The best part of putting real feelings out there…was the response I got from readers who said how true it was. Some said they had given this strip to the guilty parties to show their frustration. I had put their and my feelings in print. Somehow, seeing a situation on the comics page legitimized it. This entry was posted in Uncategorized on August 27, 2017 by stripfix. This entry was posted in Uncategorized on August 28, 2017 by stripfix. This entry was posted in Uncategorized on August 29, 2017 by stripfix. Lynn's Comments: Yes. I remember this very exchange. It was an impressive insult…my son had "the gift" and it was being used on ME! This entry was posted in Uncategorized on August 30, 2017 by stripfix. Lynn's Comments: I remember so clearly moving from Ridgeway Elementary School to Sutherland Senior Secondary. The girls were all beginning to mature. Our bodies were changing faster than the boys’ were, and suddenly our bodies were on display. This was my impression anyway. We had gone from being almost unisex beings–bumping into each other and roughhousing without too much interest in shape or size, to being physically checked out. Checked out, as in what are you wearing under what you are wearing? It wasn’t just the boys checking out the girls, it was everyone checking out everyone else. We were all changing and we wanted to know who was in the lead and who was lagging. This entry was posted in Uncategorized on August 31, 2017 by stripfix.